A classic summer dessert. Make through the summer months with delicious English strawberries. Serves 6-8. Put the margarine, caster sugar, self-raising flour, eggs, vanilla essence and hot water into a mixing bowl and beat until smooth. Divide equally between the two prepared tins and bake for about 20 minutes until the sponge is golden and springs back to the touch. Leave for 5 minutes then turn out onto a wire rack and allow to cool completely. Cut each sponge in half horizontally so that you have 4 layers. Whip the cream until stiff and fold in the Kirsch. Put about a quarter of the cream on one side for decoration. Reserve 6 evenly-sized strawberries and slice the remainder. 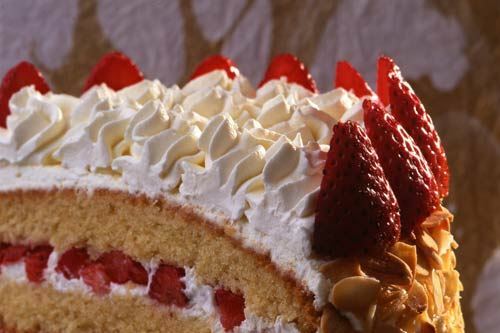 Spread each layer of sponge with cream and top with the strawberries. Make sure you leave enough cream to coat the top and sides of the gateau. Smooth the top.